When life hands you lemons….. start your own business! As many of you know CollegeMobile is an entrepreneurial venture founded by Chad Jones in 2009. Chad saw an amazing business opportunity in the world of mobile app development and started CollegeMobile and the rest is history. Around the same time I was working at a University entrepreneurial centre. Through the centre I took on a side project as the City Director of Lemonade Day Saskatchewan. Lemonade Day teaches children, in kindergarten to grade 8, the values and lessons of entrepreneurship. This program strives to plant the seeds of entrepreneurship in the youth of North America to teach them lessons that will last throughout their lifetime. Lemonade Day was founded by Michael Holthouse of Houston Texas, a very successful entrepreneur who wanted to share these lessons with the youth of North America. Every year Lemonade Day hosts a City Director’s Conference where all of us City Directors meet up to talk about best practices and share the success stories from that year. Last year I said “Chad this is a great opportunity for us to develop a mobile app that will digitize Lemonade Day’s materials.” Off I went with my carry-on suitcase filled with yellow clothes and an iPad filled with designs that I would pitch to Michael in Texas. Our whole team was excited for the possibility of working with such a great organization that did so much to empower the youth of North America. Michael and his team loved the mobile app idea right from the start and we soon began work on one of the largest apps we have ever developed. Not only were we working with an amazing organization and well-known and respected Houston Entrepreneur but we also had another cherry on top of our cake: Google for Entrepreneurs was going to fund the development of the Lemonade Day App! Lemonade Day had secured a national sponsorship from Google that would allow them to reach their goal of “1 Million Entrepreneurs”, developing a mobile app was part of this plan to spread the Lemonade Day message! 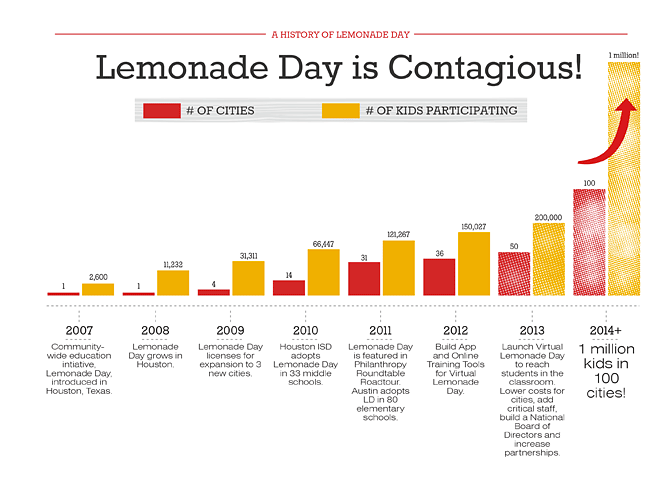 With larger projects, such as Lemonade Day, there are often many stakeholders involved. In Lemonade Day’s case there were 6 different teams working on the project! • Landtroop Strategies – a Texas-based Strategy company that took the Lemonade Day workbooks and redesigned the content for the app. It takes a lot of organization and coordination to make sure that all of these teams know what their tasks are and what the other teams are doing at any given point. Even though we were separated by 3,000+ kilometers we still managed to have very good communication by using daily email updates, daily phone calls and daily Google Hangouts that allowed us to chat face to face and share documents. Lemonade Day transformed this year from a personal project of mine to a project that I got to share with my whole CollegeMobile team. We were able to create an amazing app that will hopefully touch the lives of youth across North America. Download the Lemonade Day App for Android HERE and the Lemonade Day App for iOS HERE.